Pitch is a fun, social trick-taking game with a few different variations. Below you will find the video tutorials and explanations for the 10 point version played with four players divided into two teams, followed by the 5 point version played with four players divided into two teams, followed by the individual version played by 4 players with no teams. Each have a useful quick guide you can keep close as a reference to help you learn as you play! 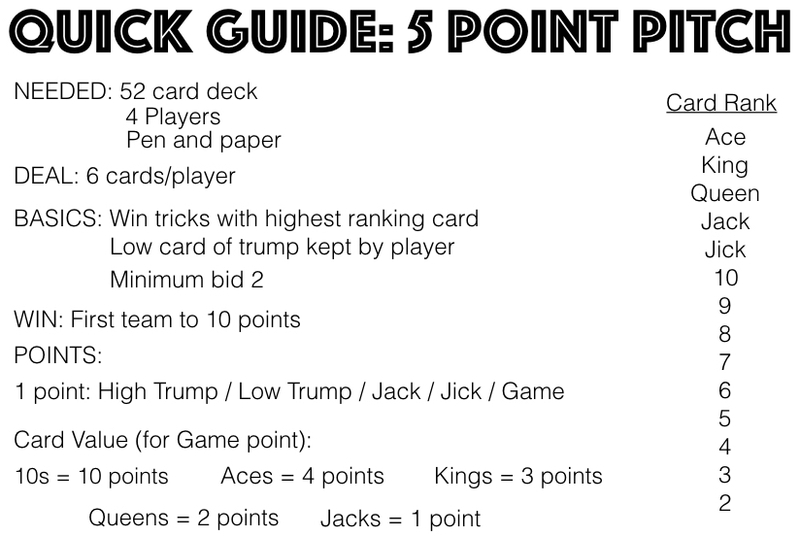 Needed: 54 card deck (jokers included); 4 players; Pen and paper for scorekeeping. Deal: Each player is dealt 9 cards in sets of 3 cards at a time. Objective: Teams score points by winning tricks with point cards in them. The first team to 52 points wins the game. Card Rank: Cards are ranked as follows – Ace, King, Queen, Jack, Jick, High Joker, Low Joker, 10, 9, 8, 7, 6, 5, 4, 3, 2. Bidding: The player left of the dealer is the first to make a bid or pass on bidding. The minimum bid is 4. Bidding continues clockwise with players having to bid higher than any previous bid or pass on bidding. The highest bidder gets to determine the trump suit. If no player bids, the dealer has to take the bid for 4. Redraw: When the trump is determined, each non-bidding player discards any non-trump suited cards and the dealer gives each player the number of cards to get each player back to 6 cards. The dealer starts with the player on his/her left and skips over the bid winner. Once each non-bidder is back to 6 cards, the bid winner receives any remaining cards in the deck. The bid winner looks the cards and keeps 6 cards for his/her hand. The bid winner needs to announce any trump suited cards that are discarded. Game Play: The player that won the bid plays the first card. Only trump cards can be played. The player with the highest ranking card wins the trick. The player that wins the trick leads the next trick. Once a player is out of trump suited cards, the rest of the player’s cards are folded. 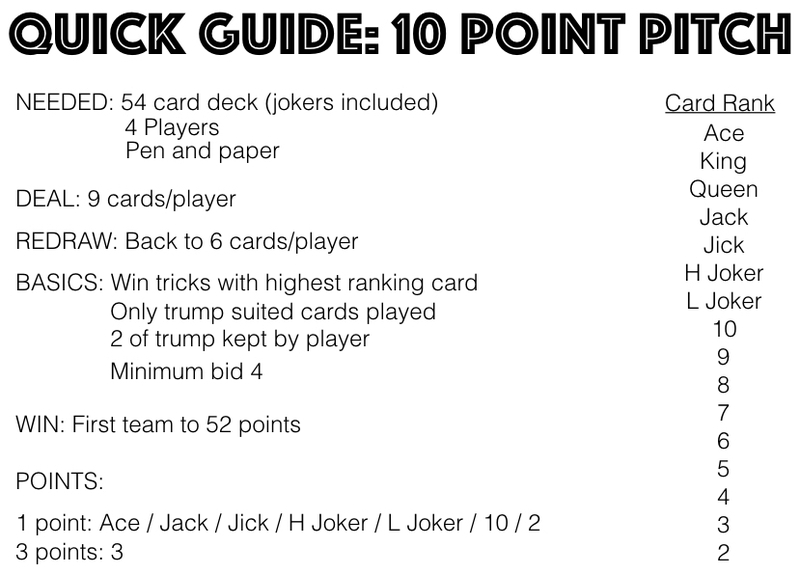 Scoring: Points are awarded for the following cards: 1 point each for the Ace, Jack, Jick, High Joker, Low Joker, 10, and 2. 3 points for the 3. Rules: If a team does not make their bid their score goes negative by the amount that was bid. If both teams get to 52 or more points after the same round, the team that bid wins, even if the other team has more points. 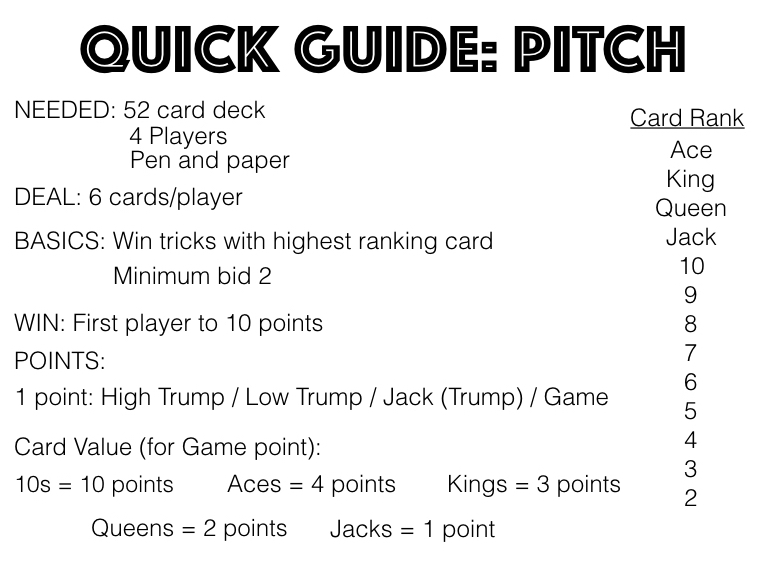 Needed: 52 card deck; 4 players; Pen and paper for scorekeeping. Deal: Each player is dealt 6 cards in sets of 2 or 3 cards at a time. Objective: Teams score points by winning tricks with point cards in them. The first team to 10 points wins the game. Card Rank: Cards are ranked as follows – Ace, King, Queen, Jack, Jick, 10, 9, 8, 7, 6, 5, 4, 3, 2. Trump suited cards outrank all other suited cards. Bidding: The player left of the dealer is the first to make a bid or pass on bidding. The minimum bid is 2. Bidding continues clockwise with players having to bid higher than any previous bid or pass on bidding. The exception being, the dealer has the option of taking the bid equal to the highest bid. The highest bidder gets to determine the trump suit. If no player bids, the dealer has to take the bid for 2. Game Play: The player that won the bid determines the trump suit and plays the first card. Players must follow suit or play a trump suited card whenever possible. The player with the highest ranking card wins the trick. The player that wins the trick leads the next trick. Rules: If a team does not make their bid their score goes negative by the amount that was bid. If both teams get to ten or more points after the same round, the team that bid wins, even if the other team has more points. Objective: Score points by winning tricks with point cards in them. The first player to an agreed upon amount, such as 10, wins the game. Card Rank: Cards are ranked as follows – Ace, King, Queen, Jack, 10, 9, 8, 7, 6, 5, 4, 3, 2. Trump suited cards outrank all other suited cards. Bidding: The player left of the dealer is the first to make a bid or pass on bidding. The minimum bid is 2. Bidding continues clockwise with players having to bid higher than any previous bid or pass on bidding. The highest bidder gets to determine the trump suit. If no player bids, the dealer has to take the bid for 2. Game Play: The player that won the bid plays the first card. The suit of the first card played is the trump suit for the round. Players must follow suit or play a trump suited card whenever possible. The player with the highest ranking card wins the trick. The player that wins the trick leads the next trick. Rules: If a player does not make his/her bid, his/her score goes negative by the amount that was bid. If multiple players get to the agreed upon amount or more points after the same round, the player that bid wins, even if another player has more points.